I will say that without a doubt, for me, the Titleist Velocity Ball is by far teh longest ball I have played !!!! I have a large yard(several acres) with a few holes set up and a large driving area so I get the opportunity to hit various balls daily and compare them. I just so happened to come upon the velocity ball, its not one that I would have purchased figuring it would be very hard, like a top flite. I shoot in the 80's and tickle the 70's, swing speed of about 107 mph with the driver and like to work the ball in both directions. First off with the driver, I crushed this ball, and the feel of it was actually fairly soft, with a little cling to the club face. I blasted it close to 310 yards. My average for my backyard range would be around 275 with a pro v, or other ball. 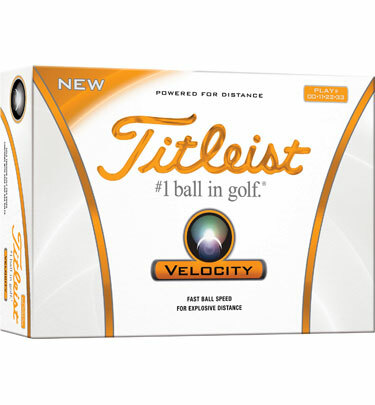 I immediately collected the one ball I had and used it in my chipping area and it felt okay, so I bought a box of velocity balls and played a round with them. Absolutley Killer!! Several drives well over 300 yards, I over drove the green on a hole with a 289 yard flag up hill about 30 feet, went right over into the rough by about 20 yards. Okay so its insanely long, so lets get to where it counts, around and on the green. Well I parred 11 holes, had not problem getting up and down for the most part. The fell on the green with the putter is actually not bad, comparable to a prov1cx I would say, very predictable feel. The only thing I can say is that that you have to factor in an extra 10 yards per club and for chipping, I had to play the ball shorter because the ball won't stick the greens per say, so you have to figure in a little bit of roll out. This is not just a ball for guys looking to look good hitting the long ball. I love it, and will play it along side my prov1x's, but for me it IS much longer!!!!! This ball was better than every ball I have ever hit. I don't just mean distance but in control off the driver as well. I got great shots with my irons and dialed in the right feel for the ball after a few rounds. This is the best ball I have ever played with and I am switching to these from Pro V1x's and Bridge Stone B-330s. I have played every ball there is and found one of these in the rough sunk in the ground after a rainy day and used it to find out what it was like and I loved it! I had the same ball when I went home, I shot my first eagle with it, lowered handicap to 13 from 16. I love it and will never switch back, until I make the pros and get endorsed. Pro V1x, Pro V1, B330, B330s, TaylorMade Penta, Taylormade TP, Callaway Diablo, Callaway Hex, Callaway big Bertha, Top Flight, Noodle, Wilson, Srixon q and Z star. Everything you could imagine.